Vein Gogh is a brand name of a device that treats tiny spider veins that are too small for Sclerotherapy. 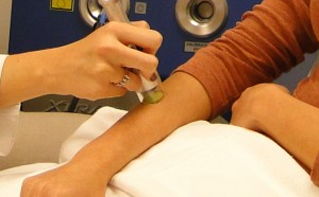 In Advanced Vein Care Center, we use Vein Gogh as an adjunctive procedure during Sclerotherapy. It is not a distinct and separate procedure appointment from Sclerotherapy. Tiny, “feathery,” and a “blush” of spider veins (called “telangiectasia”) are too small for our sclerotherapy needles to get inside the vein for injection. Vein Gogh is a hand-held device with a tiny “hair-thin” probe. It is attached by a cord to a machine that generates micro-bursts of high-frequency energy (4 MHz) which is released through the tip of the micro-probe and delivered to the tiny spider vein. The heat causes the blood vessels to close as the blood coagulates. It does not work well for the larger veins which are more amenable to Sclerotherapy, but it does work well for the tiny spider veins. Even the veins on the face can be treated with this technology. Again, it is a complementary technology to needle-based Sclerotherapy for the full spectrum of cosmetic vein treatment. Please give our informed staff a call in order to receive more information about VeinGohn and other ohmic thermolysis treatments. Our Springfield, MA office can be reached by at (413) 732-4242 or use the form below.